Middle East Perspectives by Rick Francona: B-52 deployment to the Middle East - let's drop the term "carpet bombing"
B-52 deployment to the Middle East - let's drop the term "carpet bombing"
The first U.S. Air Force B-52 heavy bombers deployed to the Persian Gulf to participate in Operation Inherent Resolve have arrived at Al Udeid (al-'Udayd) Air Base, located just a few miles outside Qatar's capital city of Doha. The huge jets from the 2nd Bomb Wing at Barksdale Air Force Base, Louisiana, represent the first operational BUFF* deployment to the Middle East since the Gulf War (Operation Desert Storm) in 1991. For the record, this deployment does not represent an increase of U.S. forces in the region - the B-1 bombers now present in theater are being rotated back to the United States for maintenance and system upgrades. The B-1 Lancer** is credited for critical air support to Syrian Kurdish fighters in their successful defense of the border city of Kobani in 2014. 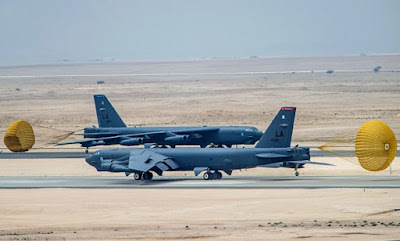 Al Udeid Air Base is home to the 379th Air Expeditionary Wing - the base sits about 900 air miles from the Iraqi city of Mosul (al-Mawsil), and about 1000 air miles from the Syrian city of al-Raqqah - both easy prey for the B-52. The two cities are the primary centers of gravity for the self-proclaimed Islamic State, more commonly known as the Islamic State in Iraq and Syria (ISIS). At some point in the near future, the fight against ISIS will be waged in and around those two cities. In Iraq for sure and probably in Syria as well, American airpower - including bombers such as the B-52 - will play a key and integral role in those battles. 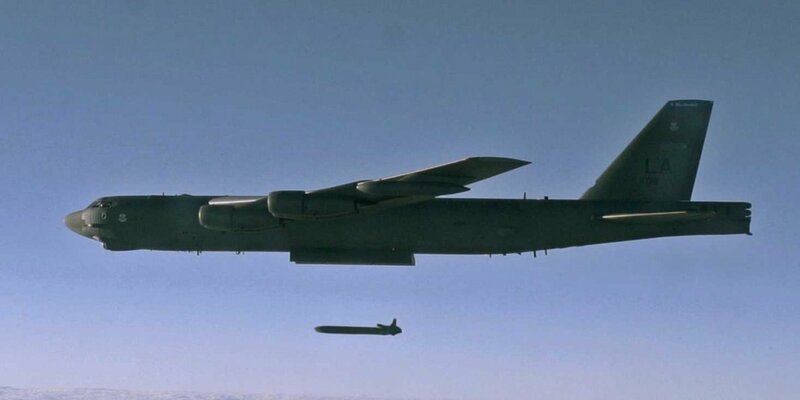 Many people associate the B-52 with the term "carpet bombing." Carpet bombing is a Vietnam-era term meaning wide-scale - some would say indiscriminate - bombing of areas suspected to be enemy troop concentrations or areas in which they have sought refuge. To be sure, the B-52 was used in Vietnam to bomb large areas where we believed either Vietcong or North Vietnamese Army (NVA) troops were present. Much of that bombing was based on sketchy intelligence. By way of disclosure, I was involved in the collection of tactical intelligence on NVA troop locations - the threshold to select targets was not high. That targeting paradigm changed with the development and deployment of precision-guided munitions (PGM). Granted, during Operation Desert Storm, we did what some might consider carpet bombing, although with great restrictions. What we see in the photograph above from Operation Desert Storm is as close as we have come to carpet bombing since the end of the Vietnam War. This is more accurately called "saturation bombing" against massed Iraqi troops in the deserts of Kuwait and southern Iraq in 1991. The targets were exclusively military and located far from civilian areas. Based on our interrogations of Iraqi prisoners of war (in which I participated) following B-52 strikes, the saturation bombing was very effective against entrenched Iraqi troops. However, most of the American aircraft dropping ordnance on Iraqi cities and areas in which civilians might be present carried PGMs - bombs and missiles designed to be guided to their targets to maximize the effectiveness of the military objectives while at the same time minimizing collateral damage (military-speak for civilian casualties). American use of PGMs as the routine method of delivery has changed the face of aerial attack - airpower is now almost required to be accurate and sterile. Today's employment of the B-52 was systemically defined during the 2001 American invasion of Afghanistan in the aftermath of the attacks on the United States on September 11, 2001. In conjunction with U.S. Air Force tactical air control parties (TACP) or U.S. Army Special Forces teams on the ground, the B-52 provided a tremendous firepower advantage - accurate airpower on demand guided by American forces with eyeballs on the target. The B-52 massive gravity bomb (also known as "dumb bomb") carrier of Vietnam has been transformed into a huge flying magazine. The aircraft was modified to carry PGMs and drop weapons one at a time rather than the "bombs away" emptying of the bomb bays - the weapons are now guided primarily by Global Positioning System (GPS) guidance modules. The B-52 remains a key asset in modern air support operations. That said, we no longer "carpet bomb." It would be useful if that phrase was erased from the lexicon of the current presidential campaign - it does a gross disservice to the men and women who place themselves in harm's way every day in the fight against ISIS. This includes flying the B-52 Stratofortress, the aircraft almost instinctively identified with the outdated phrase. Despite its age and the fact that we now have more capable bombers in the inventory, the U.S. Air Force B-52 remains an iconic symbol of American military power, or as we said in my day, "when you care enough to send the very best." * BUFF is military slang for the B-52 Stratofortress. In polite company, the acronym expands to Big Ugly Fat Fellow. Those who have ever worn an Air Force uniform know the actual terminology. ** Lancer is the official name of the B-1, but the bomber is more commonly known in Air Force circles as "the Bone" - the letter B and the word 1 - "B ONE."